Full disclosure – the original Resident Evil 2 is my favorite game of all time. I remember it like it was yesterday; scouring the local newsagents for any magazine that had a morsel of news as the release date crept ever closer. It felt like an age – no doubt lengthened by the game’s well-documented development woes following the surprise success of the Sweet Home-inspired original. Ironically, perhaps, when it finally did arrive in April of 1998 I spent the vast majority of my time cowered behind the couch, as my uncle – who had kick-started my fondness for the series by gifting me an issue of Play Magazine that featured the Spencer Mansion’s window-smashing dog on its cover – went through the motions of uncovering the secrets of the Raccoon City Police Department. Though we never did quite uncover why there wasn’t a bathroom in the entire building, mind. 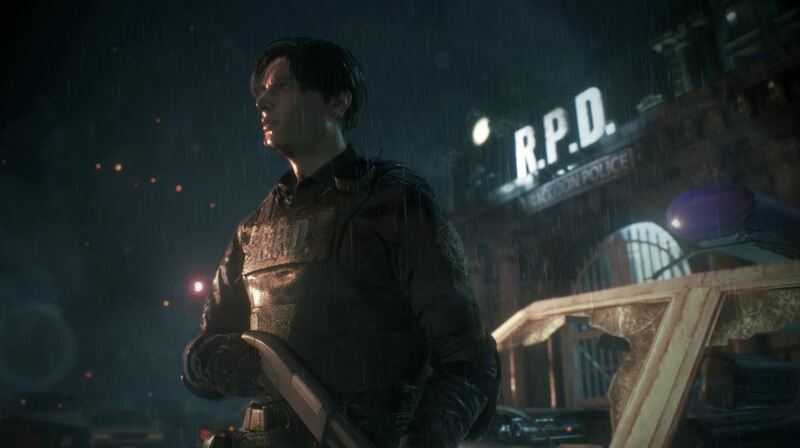 Technically speaking, the Resident Evil 2 remake isn’t just a magnificent recreation of one of the best games ever, it’s a stunning contemporary effort in its own right, too. It was the guttural, deep sound of the zombies; the foreboding sense of urgency that was then replaced by the slow-paced meticulous nature of the RPD itself. In truth, there hasn’t been a survival horror game that has had as profound an effect on me as Resident Evil 2. It was a natural evolution from its predecessor – larger, more intricate, technically sounder, and far more grandiose in its narrative. 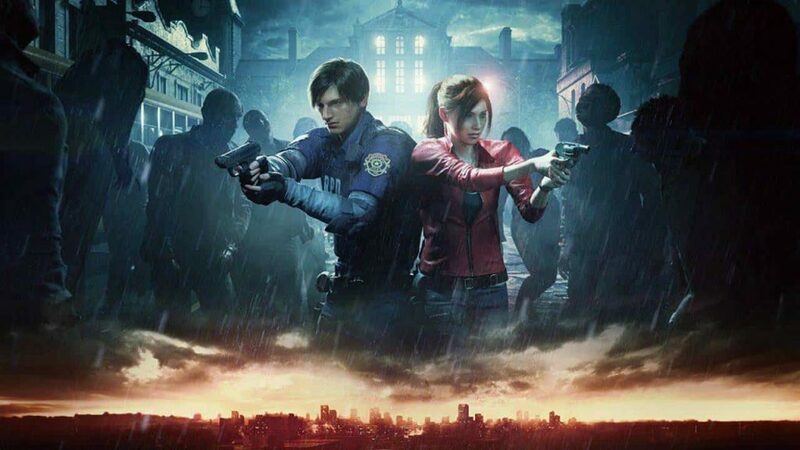 It planted the seed and set the tempo for future releases to come so it’s perhaps fitting, then, that this remake some twenty years later tightens and expands these advancements and presents the maiden story of Leon S. Kennedy and Claire Redfield in a smarter, more refined, and tense fashion. Make no mistake, the Resident Evil 2 remake doesn’t simply retread old ground, it repaves it. 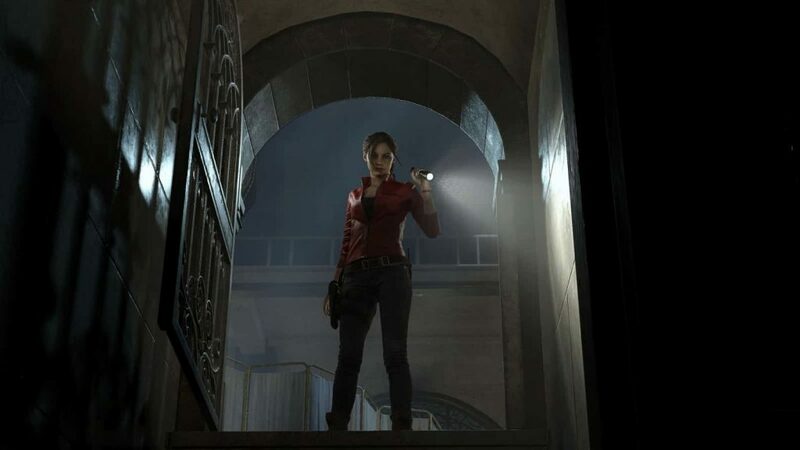 It was an unenviable task that developer Capcom faced, that’s for sure, having to systematically overhaul the second entry in one of its premier franchises to a more drastic degree than that of its stunning effort with original Resident Evil back in 2002. 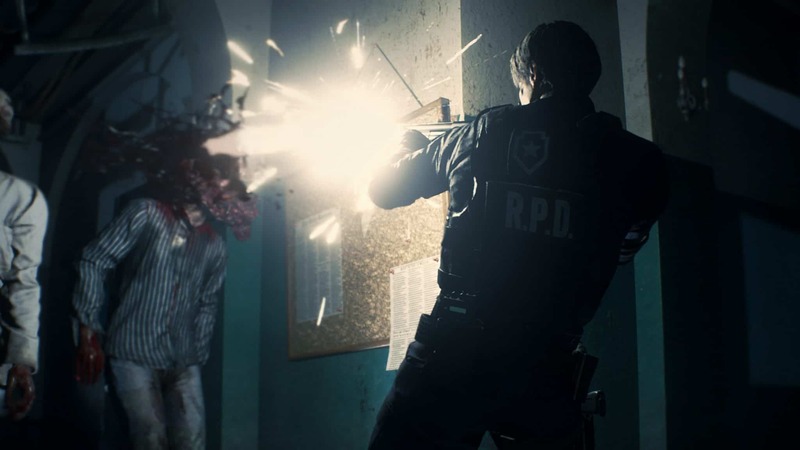 Times have changed and so has certain development sensibilities, so there has much more on the line – and indeed much more room to slip up – when trying to modernize Resident Evil 2’s key components, such as its ‘zapping system’ and its popular set of characters. For the remake, the dual campaigns are back, with one for both Leon and Claire; completing one will unlock the ‘B-side’ of the other, which changes the introduction up a little and some other small aspects. Leon is still imbued with that innate sense of duty, whilst Claire acts as the spunky counterweight, quick to stand up and be counted on when push comes to shove. Though the resolutely fixed perspective of the 1998 original have been eschewed, the new over-the-shoulder perspective gives Capcom plenty of new ways to terrify and unnerve the player. 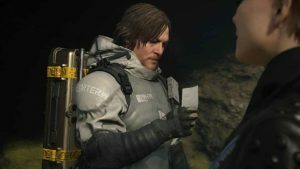 Though their character outlines remain mostly intact, Capcom has added substantially to each, creating a level of depth and relatability that really makes you empathize with their conjoined plight. Graphical advancements in the last twenty years would of course dictate that both protagonists will be more expressive, emotive, and realistic, but the great writing, added interactions, and overall tension that is borne out of the ambiance and how they react to the horror means that this is without a doubt the most well-rounded iteration of each character to date. What perhaps wasn’t as expected, however, is just how the game treats its eclectic cast of side characters. There’s been a lot of discussion leveled towards which creatures have and have not made the cut this time around but one of the most remarkable aspects of this remake, especially for those with an affinity for the original, is the amount of additional characterization and depth that has been afforded to virtually every single side character along the way. Some of these appearances are fleeting, sure, whilst others are given more prominent roles in the overall story, but irrespective of screen time you’ll come out the other side with an added appreciation for each due to the care that Capcom has evidently put in. Without veering into spoiler territory, Annette Birkin’s role in both campaigns is night and day compared to that of the original; she’s now a multifaceted character with agency who’s intrinsic to the game’s narrative. Her arc just makes a lot more sense in the context of this reimagining. There are other examples, too, as each character brings a mature weight to proceedings, but in terms of a contrast between both games Annette is certainly the starkest. Resident Evil 2’s dual campaign structure returns – albeit with some significant changes to how each play out and intersect with the other. Fundamentally, Resident Evil is about management; negotiating the balance between risk versus reward. We’ve all been there. Your health is on ‘caution’, you’ve just gotten a precinct key that’s paved the way to a new area but you’re low on ammunition. You unlock the door and it creaks open, unveiling three or four shambling zombies; you turn around, straight back the way you came. You start to form a plan: should you use the 6 handgun bullets you’ve got left? Should you kill the first one and then try and bait the rest to give you space to run past? Classic Resident Evil asks questions of its players and expects solutions based upon logical assessment. While this ethos has been diluted in later releases, it’s back here in spades. Resident Evil 2 Remake is a tense experience through and through. It can be bloody difficult, too. The word ‘relentless’ comes to mind immediately. The iconic RPD building is now a mixture of dimmed light and darkness, with zombies placed in well-trodden areas and narrow hallways. They’re aggressive, persistent, and should never be underestimated. 20 handgun bullets may seem generous in comparison to the paltry offerings in the original, but zombies can now routinely take six shots directly to the head and still get up to just absorb another half a clip with ease. It forces you to be strategic. Some may find their resilience to be a shortcoming or indeed overkill, but to me it feels designed to elicit that feeling of claustrophobia and impotency. And it works. Add the stoic persistence of Mr. X into the mix and the game can get quite stressful as you backtrack and open new areas with the aforementioned tyrant in tow. One thing to note – aside from the fact that Lickers are a nightmare this time around and can make use of vents – is just how layered each of the enemies are. They’re far more intelligent, multidimensional and can often surprise you with their ability to inflict damage from a starting point you’d normally gauge as safe. More than perhaps any other entry in the series, 2019’s Resident Evil 2 places a premium on accurate headshots and the preservation of precious ammunition. Some will decry the lack of certain enemies, namely that of spiders, and though that is unfortunate, the game never feels as though it’s lacking in the enemy variety department simply because there’s so many variables at the heart of these encounters. There are numerous instances of entering a room only to be faced with multiple zombies closing in on your position while the sound of menacing footsteps can be heard from behind. Practically no area is safe, either. The station itself has retained its iconic atmosphere and its modernized layout works brilliantly. The backtracking has purpose; the key items are well designed, and the constant threat of Mr. X pushes the pace well. What’s interesting is how Capcom has managed to retain tension with its contemporary camera view and controls. The original Resident Evil 2 used its limitations smartly to increase the stress of the game; the fixed cameras hid areas where enemies could lurk, and the tank-like controls dictated that you couldn’t turn on a dime. This time around both Leon and Claire control very fluidity but despite this you’re still vulnerable and at the behest of the enemies. Surprisingly, Capcom has plumped for a decidedly minimalist soundtrack with a greater emphasis on spatial sound effects which’ll undoubtedly be to the chagrin of veteran players. As a compromise the old-school OST and sound effect swap is wonderful, but that’s unfortunately locked behind more expensive editions of the game. 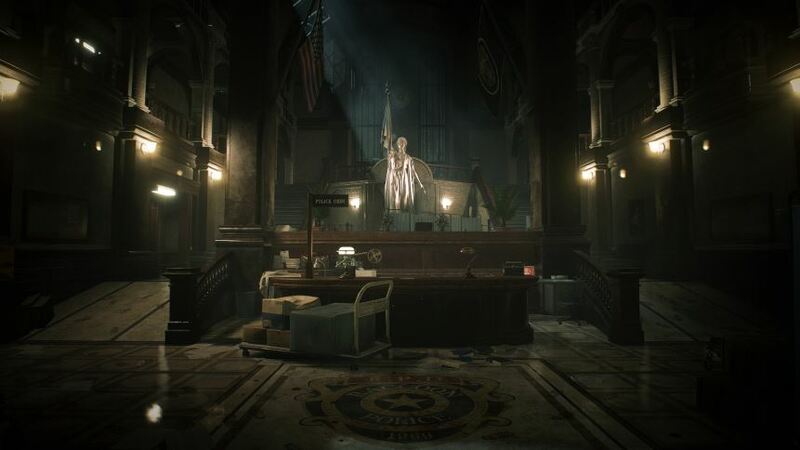 For what Capcom is trying to achieve, however, the new sound setup oozes atmosphere, and the distant footsteps of Mr. X are as effective in subsequent playthroughs. The iconic Lickers return as formidable foes, as does the enigmatic Mr X. Like Resident Evil 7’s Baker estate, the RPD building feels lived in, and it’s still one of the most affecting locales in gaming. For those pining for some more city-based exploration, however, you’re fresh out of luck. It now takes less time to reach the entrance to the police station than in the original. And though you do venture out into the city briefly in both campaigns separately, the remake does by-and-large follow the same story beats albeit jumbled up a bit. The city parts are extremely linear, too, which is a real shame, as Raccoon City is as much a character as anybody in the series. Though city exploration is the real focal point of Resident Evil 3: Nemesis, it would’ve been nice to at least be able to enter different storefronts, however small, and it would’ve added some of the environmental depth that’s so present in every other portion of the game. Despite its linearity, the rain-sodden streets of Raccoon City are positively gorgeous, and the game as a whole is quite a technical feat. The environments are, for the most part, richly detailed and paint a picture of unbridled chaos with blood splashes affixed to every crevice and books and posters strewn across top surfaces and floors. The use of sterile, cold colours in later areas also acts as a nice contrast to the mahogany-tinged walls of the RPD. That said, there seems to be slight issue, especially in the latter part of the game, where reflections from metallic surfaces don’t cast the image on the floor in front of you correctly. It sort of shimmers and can be a bit distracting with how frequent it is. On the other hand, the facial capture and emotive animation are top notch and bring so much life to each character on-screen. Arguably as much a character as the flesh and blood denizens that inhabit its moody halls, the Raccoon Police Department building is given a deeply foreboding and utterly grim presence in this remake. Though nostalgia certainly plays a part in seeing these characters more fully realized, you can really feel the struggle and desperation on some of their faces. Also look out for the burger in the opening shot of the game – it’s a real looker. In terms of graphical options, the game doesn’t support a distinction between 4K/30 frames per second or 1080p/60 frames per second for PS4 Pro users like was previously reported, instead Capcom opted for a 4K display with a variable frame rate as standard. 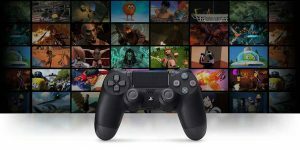 It feels great and is definitely holding an average above 30 frames per second which is commendable given the Pro’s specifications. 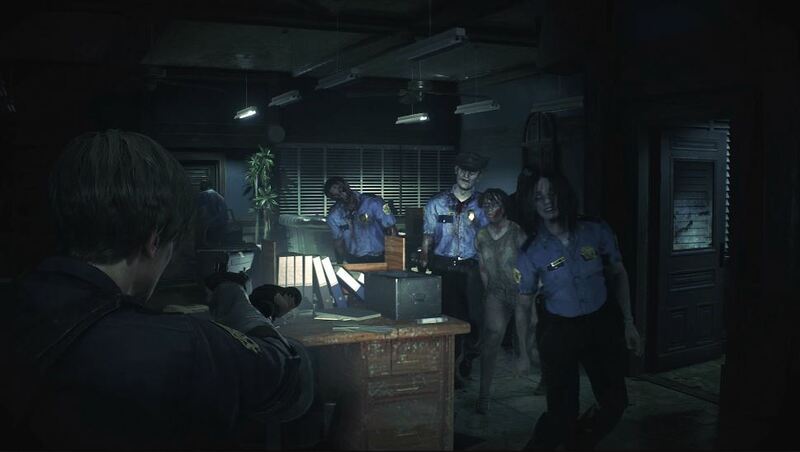 In many ways, Capcom has achieved the near-impossible with the remake of Resident Evil 2. It’s a remarkable labour of design, iteration, faithfulness, and adaptation; a masterclass in knowing what to change, how to change it, and what to build upon. Sure, there are some slight niggles and design choices that perhaps long-time fans won’t appreciate but there’s no denying that Capcom has been bold in its design philosophy and has exuded a confidence and consistency in its execution throughout. The biggest compliment that can be leveled is how the game manages to elicit the same sense of dread and consequence that made the original a classic whilst injecting just enough complexity and modern sensibility to see it emerge from the shadow of its namesake with consummate ease. 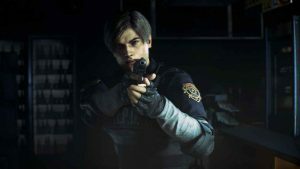 Published and developed by Capcom, Resident Evil 2 releases on January 25, 2019 for PS4, Xbox One and PC. 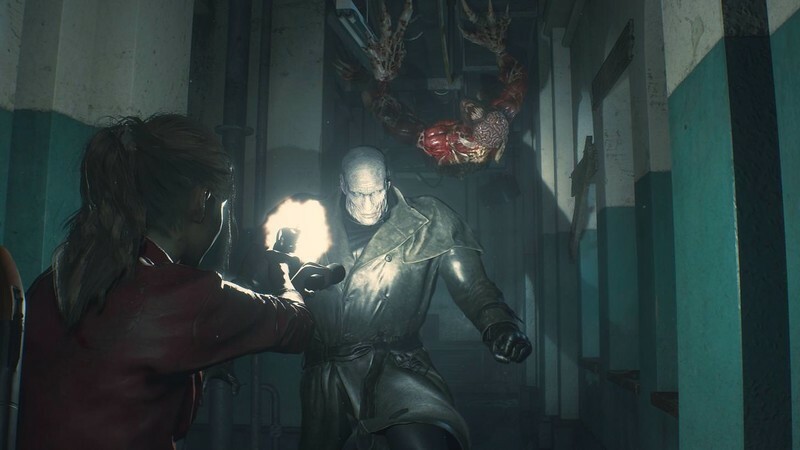 Capcom has achieved the near-impossible with the remake of Resident Evil 2. A remarkable labour of design, iteration, faithfulness, and adaptation; a masterclass in knowing what to change, how to change it, and what to build upon, Resident Evil 2 in 2019 emerges from the shadow of its namesake with consummate ease.